Chevy Volt owners discuss the benefits of Chevy Volt and how well it fairs in cold weathers. Reference from GM Electric Vehicle Owners on Facebook. Consider this. You are in a snow storm. Traffic is stopped. Radio says 24 hours till you can move. With a full tank of gas in the Volt, you will have about 35 hours of heat that will be automatic. The engine will run about 15 min heating the car and the battery as well as charging the battery. The engine shuts off and the Volt heats on battery only. Then the cycle repeats. In other electric cars, 1-3 hours max. You could freeze to death in Michigan weather. If your daily trips are forty miles, but you occasionally need to go further, the Volt is the perfect car. I live in Ottawa, where the winters are brutal. The added bonus of the low centre of gravity the location of the battery creates,is great for driving in snow. The “range extender” is great when you need it. I had a 2014 Volt, and a roughly 40 mile commute to work as well, of which about 24 of it is freeway. In the summer I could easily get 50 miles out of the battery. In winter with heater usage it dropped to 26 miles, so I always burned about a 1/3rd of a gallon everyday in winter. Which still meant a full tank could last me a month. When I got a 2017 Volt, I got 40 miles out of it in winter with heater usage, and 68 miles in summer. The only time the engine ran was if it was really cold outside (15 degrees F or lower), in which case the engine runs automatically to assist in cabin heating, or if I took a long distance trip where you would have to use gas. I own a Volt and live in the cold climate of Colorado. I would go with the Gen 2 Volt 2016-present. We keep it warm in the garage but if you have to park outside at least keep it plugged in to condition battery temp. A nice thing about buying a used Volt is the engine mileage is usually less than total mileage so you get a better car than you think. My 2012 had 48K but the motor was under 20K. The price difference from 2015 Gen1 to any Gen2 makes the Gen2 the best deal because of the better electric range. Keep in mind rear seat headroom for Gen2 not good for people over six feet tall. I'm six foot two and can't sit back there very long. Also check out Matt Blecha's story titled Volt Owner Shares Tips for Driving Chevy Volt in Winter. 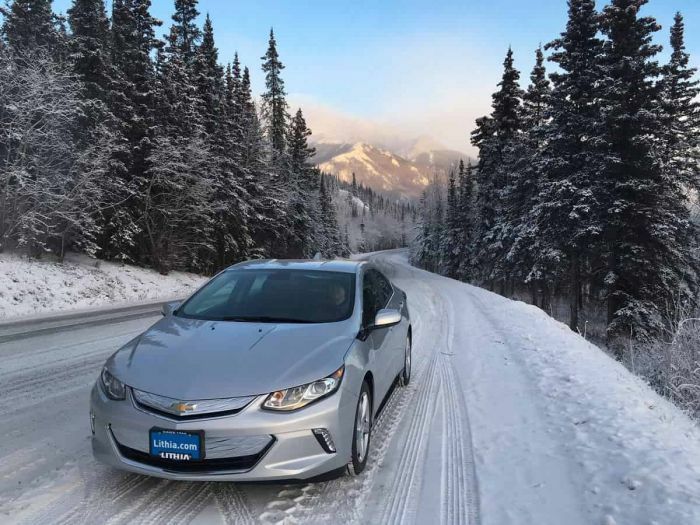 What are the advantages and disadvantages of your Chevy Volt or another EV during summer and winter times? This article misses several points. First, in addition to the setting the temperature (either 35F or 15F) at which the engine kicks in to help heat the car, you can select whether or not the battery continues to help heat the cabin (Full, eco, engine heat only). This matters because on shorter trips you can minimize petrol used to heat the car and on longer trips you can choose not spend any juice on the heater. This matters because the engines behaves differently (optimizes efficiency rather than keeping the battery charged) than when the battery is drained. Also, the article mentions nothing about the advantages of having a low center of gravity and 50/50 weight distribution when driving in the snow.